I was very pleased with the lunch Ryder and I made on Friday and wanted to share the end result. The couscous was even better that night for dinner and the next day for lunch (you can tell I like it just a little!) I had some fresh meyer lemons from my friends garden and squeezed those with the olive oil for the dressing. I loved the fresh tartness of the lemon, so I would recommend lemon over vinegar. OK Thursday came up much too quickly this time around. I am now looking back on my week of cooking and realizing it wasn’t so exciting- bad Julie. Anyways I am excited about my lunch I am going to prepare for my girlfriend tomorrow. So I figure I’ll tell you what I am making tomorrow….. 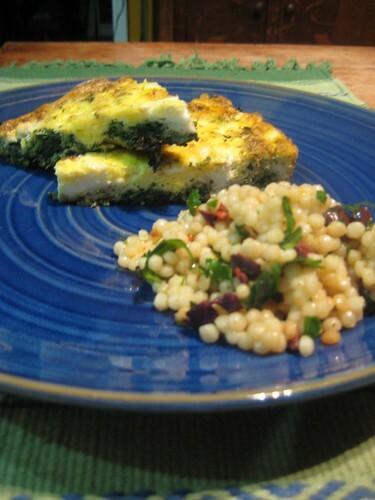 I am a big fan of spinach and feta so that is the kind of Frittata I will be making. through in oven (350 degree) for 5-10 minutes (depends on the oven and how firm you let the eggs get on the stove-top) I like it to be golden brown on the top. olive oil and vinegar (whatever type of vinegar- I have used apple cider-but I guess it’s just preference) If your sun-dried tomatoes are jarred in oil – be careful on the amount of oil you add at the end. You can even just squeeze some fresh lemon in the oil as your acid for the dressing- especially if lemons are in season. I like to make more because it’s even better the next day after all the flavor’s have had time to meld together. My friend made the couscous for us after Saige was born as part of a dinner and I just loved it. The beauty of both is that you can add whatever you want or are in the mood for- it’s a very forgiving and flexible meal.